Tom Brady, the most-talked about player in the NFL this offseason, has turned the conversation back to the field in recent weeks with his continued excellence as one of the game’s best players. Even as the seven-month Deflategate investigation and litigation dragged through the summer, most expected that he would eventually return to the field and perform at the level of an elite NFL quarterback. However, while he has returned to an elite level of play, he certainly is not at an elite level of pay. In fact, he is astonishingly far from it. Obscured in the offseason of deflation allegation, frustration, obfuscation and litigation is this: Tom Brady is as underpaid a player as there is in the NFL this season, paid at a level closer to a journeyman starting quarterback than an elite one. Brady’s 2015, 2016 and 2017 compensation levels are true mysteries in the business of football. Let’s examine. In 2013, Brady restructured his contract, which had two years remaining, in what appeared to be a two-part negotiation: a cap restructure and a (peculiar) extension. Before the renegotiation, Brady was scheduled to make $30 million through a couple of high salaries. After the renegotiation, that number became $33 million, consisting of a $30 million signing bonus (the last deferred payment of which was paid in February to the tune of $5 million) and salaries of $1 million for 2013 and $2 million for 2014. Thus, the Patriots got better cap flexibility due to the prorated bonus while Brady received significantly better cash flow and an extra $3 million to boot. Had the renegotiation ended there, there would have been nothing out of the ordinary about the deal. However, the deal added an extension with “out years”—2015, 2016 and 2017—at salaries of $7, $8, and $9 million, respectively. As anyone with even a casual following of the business of football knows, these are startlingly low numbers for a quarterback of Brady’s caliber. • INSIDE THE BELICHICK-BRADY RELATIONSHIP: The longest-lasting and most intriguing coach-quarterback pairing in NFL history is all business—and that may be the key to its enduring success. At the time of the extension, many praised Brady for his selflessness and sacrifice with this contract. I was skeptical and, as the narrative applied to 2013 and 2014, with good reason: Brady’s “sacrifice” netted a $30 million signing bonus and $3 million more than he was supposed to make over that time frame. As for the out years, I was equally cynical and thought there was no way in God’s green earth that Tom Brady would be playing for those numbers come 2015. Surely, I thought, the Patriots and Brady would upgrade the contract before 2015 and replace the out years with more suitable salaries. Well, the contract did get upgraded, but not an upgrade with true meaning for Brady. It added a relatively insignificant $1 million per year, bringing the salaries to $8 million this year, $9 and $10 million for 2016 and 2017, while invalidating a clause that had fully guaranteed those years (an injury-only guarantee replaced it). This renegotiation at the end of last season represented yet another curious chapter to this contract. Perhaps the Patriots wanted to avoid funding a guarantee for their best player; perhaps it was an expedient way to get Brady another $3 million. In either case, why would the Patriots and Brady only nominally upgrade a massively undervalued contract, while devaluing the guarantee in the process? Why is Brady still astoundingly underpaid? • NFLPA WON THE BRADY BATTLE; CAN THEY WIN THE WAR? : The union took a victory lap after their Deflategate win. Now, can they parlay that victory into a meaningful reduction of Roger Goodell’s power? Brady’s 2015 compensation of $8 million is roughly 1) a quarter of Wilson, Eli Manning, Rivers, Roethlisberger and Newton ($31 million and above); 2) a half of Peyton Manning, Jay Cutler and top rookies Jameis Winston and Marcus Mariota ($15 million or above); and 3) $11 million less than longtime peer Drew Brees ($19 million). • PETER KING’S FINE FIFTEEN: PATS STAY ON TOP: But other contenders, led by elite quarterbacks, are coming on fast as New England heads into a bye week. In 25 years of being on both sides of the business of football and now analyzing it, I have not seen such a harsh discount, with Brady earning roughly $10 million per year below his market value. I know some are saying that Brady has always taken less than he could have and never squeezed the Patriots for full-market value. While that may be true, those differences have never been more than in the $1-2 million per year range. Then there is the storyline: “Well, Brady’s made a ton of money, makes a lot of endorsement money and his wife is a supermodel who makes more than him; he doesn’t need it!” That is a convenient narrative, but players do not willingly sacrifice market level earnings—especially at such extreme levels—due to having other income streams. While it is possible that is the explanation here, it would represent an extreme outlier from customary business practices. • KAM CHANCELLOR RETURNS…: But does the end of his holdout mean he ‘caved’? What’s next in the Seahawks’ negotiations with their star safety. The true beneficiary of Brady’s sacrifice is, of course, the Patriots and their access to the $10 million that should be going to him these three seasons but has been used for other purposes. Not only were they able to leverage the flexibility gained in 2013 and 2014 from Brady’s cap restructure, but they now benefit from his sacrifice in the out years in terms of both overall value and lack of full guarantee triggering a funding requirement. Brady’s willingness to help the team financially is far beyond the norm. While the NFL appeal of the Brady court ruling rattles through the judiciary over the next year, the 2013 Brady contract will still resonate this year and beyond. Brady’s willingness to significantly deflate (sorry!) his future earnings to benefit the Patriots in 2013, something that I thought would be a long-gone mirage by now, is in full effect. Brady’s play remains elite while his pay remains pedestrian. And a final thought on whether referee Ed Hochuli told Cam Newton he “was not old enough” to get a roughing the passer call: if Hochuli did indeed say it, I would not be surprised nor think it one of the more egregious things said by officials to players or coaches about calls or non-calls. This appears to be a “you don’t want to know how the sausage is made” moment in the NFL. If it is in fact what Newton heard (it seems like an odd thing to make up or mishear), Newton may have broken the code in speaking publicly about it. What happens on the field is supposed to stay on the field in the NFL. In recent years the public has been taken behind the curtain to see the seamier side of the sport; this may be one more (relatively harmless) example. 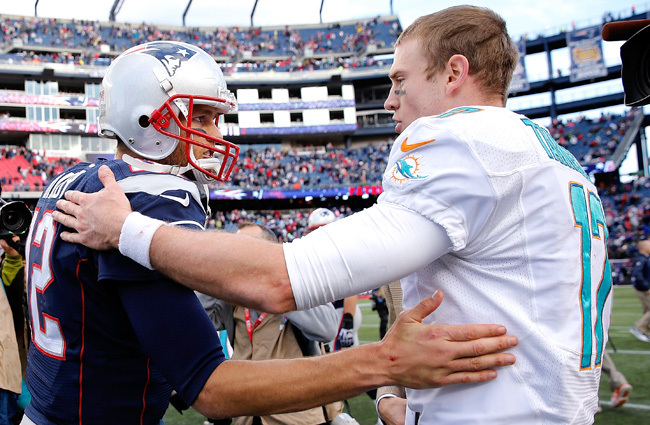 The NFLPA Won the Brady Battle; Can They Win the War?